TORONTO, ON – Innis & Gunn has announced that the inaugural release in its Latitude & Longitude series – an annual series of limited edition beers “taking inspiration from some of the most loved beer styles from around the world” – is now available in Canada. We’ve stayed true to the farmhouse style, brewing the beer with Ale and Acid Malt and then fermenting it with a wild saison yeast. Then we’ve matured the beer in barrels containing heaps of Scottish Raspberries. This raspberry brew is perfect for those sunshine days; a refreshing beer, flinty and dry with wonderful raspberry flavours and aromas. 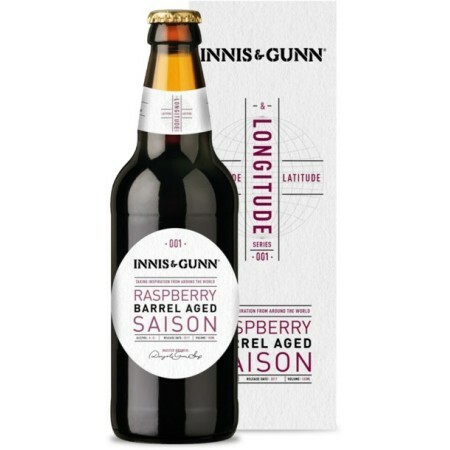 Innis & Gunn Raspberry Barrel Aged Saison is available now in 500 ml bottles at stores in Alberta, British Columbia, Manitoba, New Brunswick, Newfoundland, Ontario, and Saskatchewan. For more details on availability and pricing, check with local beer and liquor retailers in these provinces.